The slugging outfielder, a free agent after this season, said a local barber did the job. 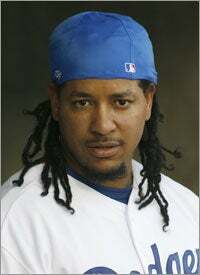 Ramirez said he plans to get his next haircut before spring training. So did Manny’s production drop after trimming back his dreadlocks? Yes. The hot-hitting Ramirez, who hit safely in 11 of his first 12 games as a Dodger, went 0-for-3 with an intentional walk in last night’s 3-1 Dodgers’ win against the Phillies. Following the game, Dodgers manager Joe Torre apparently did not appreciate being asked if Manny’s trim had anything to do with his hitless night at Chavez Ravine. 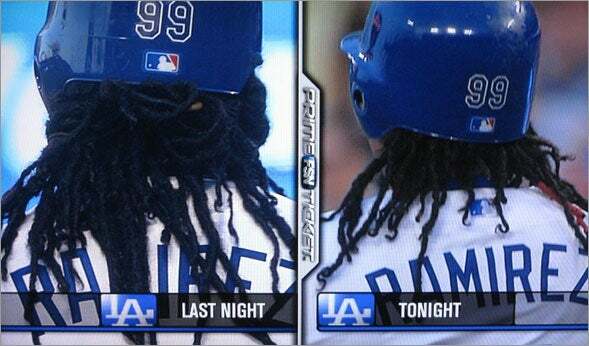 In the days leading up to the haircut, Torre jokingly said he would be run out of town if Ramirez stopped hitting, especially with the Dodgers starting to sell Ramirez-style dreadlock wigs in their team stores this week. Torre said Ramirez has needled him on the subject recently, telling him, “It’s the hair,” whenever he got a hit. Earlier in the week, T.J. Simers of the LA Times had reported that a deal had been reached to cut Manny’s hair with the proceeds going to a Dodgers charity.